Here's a column I wrote for the Charleston Gazette-Mail about agritourism and how it benefits all of us. An endless field of bright orange pumpkins with green vines sprout from the earth. Tots bounce from patch to patch eyeing which orb they can fashion into the perfect jack-o’-lantern. The hayride circles back around to retrieve the next crop of farm-goers. Farm workers regale visitors with the history of the farm and agriculture. And, a few rows over, families reach up to pluck fresh apples from bushy trees. This beautiful scene painted at Orr’s Farm Market in Martinsburg is an essential part of fall in Appalachia. Is it really autumn if you don’t leave a family farm with a pumpkin or two under your arm and a peck of apples at your side? Many farms are no longer simply planting crops and raising livestock. Rather, they are destinations that provide experiences and memories that last a lifetime — otherwise known agritourism. 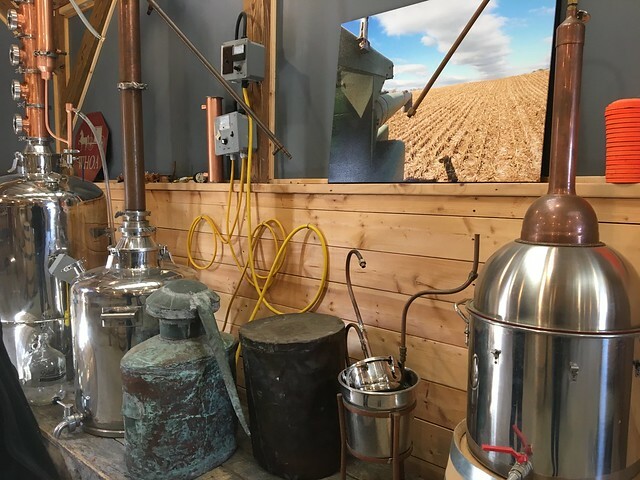 Agritourism, by broad definition, encompasses farms providing additional activities, events or education at the property that draw visitors to generate additional income. West Virginia farms are incorporating corn mazes, produce picking, hayrides, educational activities, games, restaurants that use local food and even bed-and-breakfasts, often known as farm stays. More and more local farms are investing in this concept of agritourism, which has served small West Virginia family farms well and can contribute to growing the state economy. “I’ve heard a lot of customers tell me how much it means to them to come, relax, pick berries and get away from everything,” said Katy Orr-Dove, retail market manager at Orr’s Farm Market and third-generation family member to work at the farm. Not only do these experiences define the season, the additional profit farms receive also makes an impact — one that could be crucial to the success and future growth for family farms. These farm-based tourism opportunities are another way for farms to diversify their income, and judging by the success of farms like Orr’s, it may be time to evaluate this new opportunity. Other farms like Gritt’s Farm, in Buffalo, offer playgrounds, apple slingshots and even a giant corn bin in which to play. At Sickler Farm in Moatsville, you can purchase mums and flowers. Byrnside Branch Farm in Union has bonfires and kettle corn. As Cindy Martel, marketing specialist with the West Virginia Department of Agriculture, said in a previous story in the Gazette-Mail, this concept tends to work best when several operations “cluster” to create an area with several attractions, rather than just one, to help draw in folks. This concept may not work well for every farm, I realize that. Many face location, staff or safety concerns. And others may struggle with activities outside of fall. But the potential is enormous. These farms have integrated themselves into our experiences as West Virginians. The thrill of finding the perfect pumpkin to set out at Halloween is a cherished memory, and peeling freshly plucked apples for a homemade applesauce makes that farm — those people — part of our family. “It’s very special to me ... it’s a lot of work and we have some days where we’re just exhausted, especially this time of year. But I go stand by the registers and watch kids come through with pumpkins and see how excited they are to be here,” Dove-Orr said. Fall in West Virginia isn’t complete without a trip to the pumpkin patch and apple orchard, and our small farms are integral to that experience — all while working together to grow our state’s economy. The West Virginia Department of Agriculture, The West Virginia Division of Tourism, West Virginia University Extension Service and West Virginia State University are all working to make this opportunity available for more farms. For more information on venturing into the agritourism market, visit http://anr.ext.wvu.edu/agritourism. Candace Nelson is a marketing and public relations professional living in Morgantown. 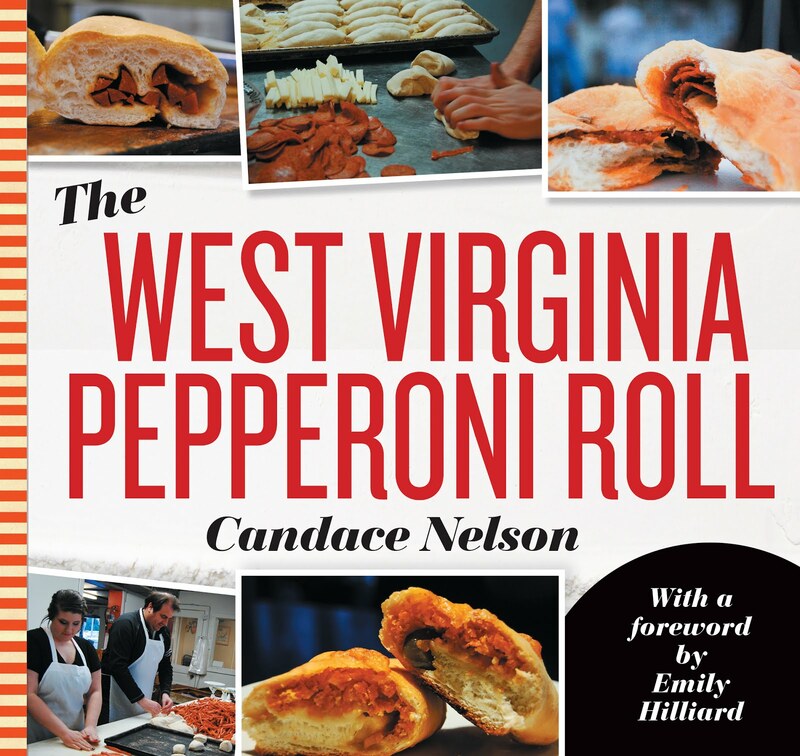 In her free time, Nelson blogs about West Virginia food culture at CandaceLately.com. Follow @Candace07 on Twitter or email Candace127@gmail.com. This recipe, which can be made with apples from Orr’s Farm Market, is simple, and Katy said it has been enjoyed by many folks for many years. Place all ingredients in a Crock-Pot on low for 4 to 6 hours. Stir occasionally, adding more cider if needed. The key to this recipe is serving it warm at the end of a long cold day. Add a little cream on top for a special treat. Here's a column I wrote about Hawk Knob Cidery for the Charleston Gazette-Mail, which talks about how hard cider may be the next trend in West Virginia. Appalachia has a long history with hard cider. When prohibition leveled apple orchards and halted production of alcoholic beverages across the country, it didn’t stop many folks in West Virginia. 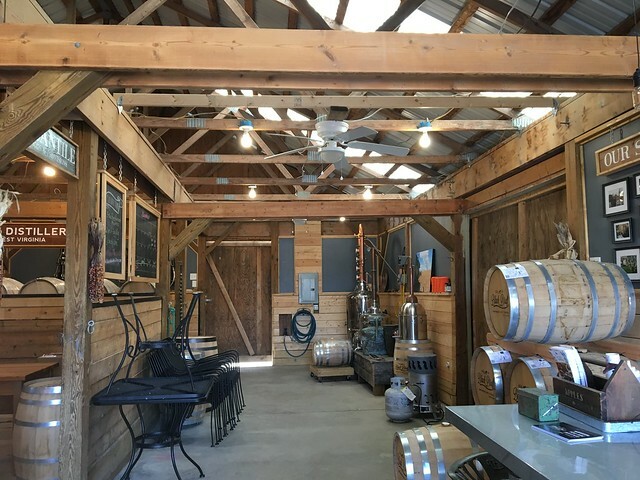 Bennett, along with Will Lewis, opened Hawk Knob — the state’s first hard cidery — in 2014, where they specialize in dry traditional, heirloom hard cider. Prohibition saw many orchards cut down and the end of production of hard cider in many areas — with the exception of some renegade farmers in the mountains — and once that time period ended, beer made more of a comeback. This piece of cultural heritage has endured in small, family pockets around the region, and now, Bennett and Lewis are bringing that Appalachian tradition to the forefront again. And they’re doing it in a way that pays homage to cultural heritage. Hawk Knob currently has five hard ciders in production: Appalachian Classic, Appalachian Classic Bourbon Barrel Aged, Elderberry Infused, Wild Fermented Traditional and Cherry — which was released just a few weeks ago. And there are more on the horizon — maybe a dry-hopped cider or a British bittersweet. Hard cider, which has persevered through tough times, is intrinsically Appalachian and something we should embrace and invest in to help contribute to a thriving economy. In neighboring Virginia, there are nearly two dozen cideries. For the past few years, the cider market has been the fastest growing sector of the alcohol market — growing at about 75 percent each year, Bennett said. The farmers, the producers and the network of people between them each contribute to, and benefit from, this lucrative industry, Lewis said. That’s a lot of opportunity for West Virginia. “And we have just as much — if not more — potential than our neighbors. There’s a lot we can do in our climate. The higher altitude and climate lend themselves to more creativity,” he said. After paving the way for this industry, Bennett and Lewis are encouraging others to follow in their steps. “We’ve heard tell there are maybe five other cideries possibly in the works, and hopefully in the next three years, we’ll see more open up,” Lewis said. 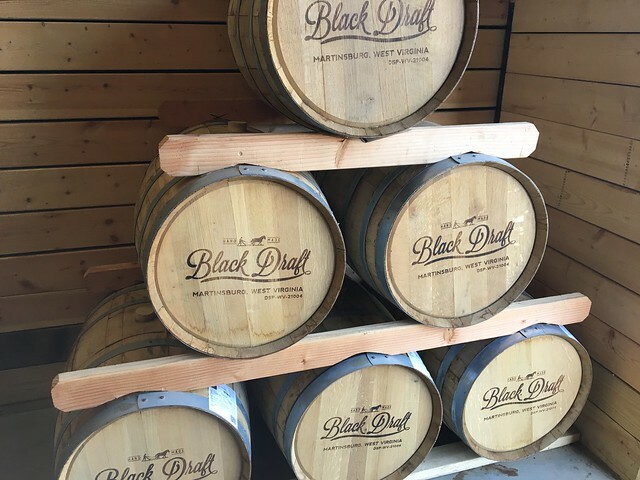 “We would love to see more cideries open up — which is better for the state. The more we get in here, the more tourism we’ll get. 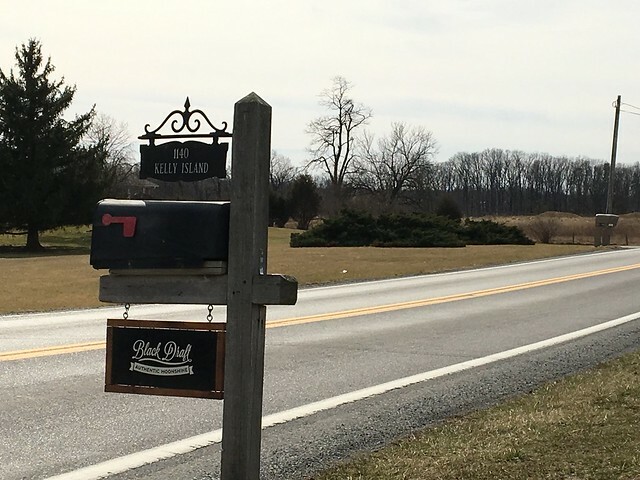 More people are going to come here to visit three cideries than they will for just one,” Bennett added. As Bennett and Lewis revive this overlooked part of cultural history in West Virginia, they are laying the groundwork for other cideries to open. And, considering the fast growth and opportunity for success, this industry could be more than just a deeply rooted part of our history. It could have a strong future in Appalachia, too. Dice up bacon really fine and fry until almost crispy. Dice up onions and fry alongside the bacon. Throw in a handful of white raisins just before bacon is crispy. Transfer everything — grease and all — to a pot and throw in chopped collard greens once the raisins are soft and swelling. Add one whole bottle of Appalachian Classic or Barrel Aged Appalachian Classic Hard Cider. Top the rest of the pot off by filling with water or fresh cider just to cover the collards and simmer for about four hours. “Sooo good,” Josh Bennett said. Want more hard cider pairings? “Pork roasts are absolutely excellent when cooked in any of the ciders. 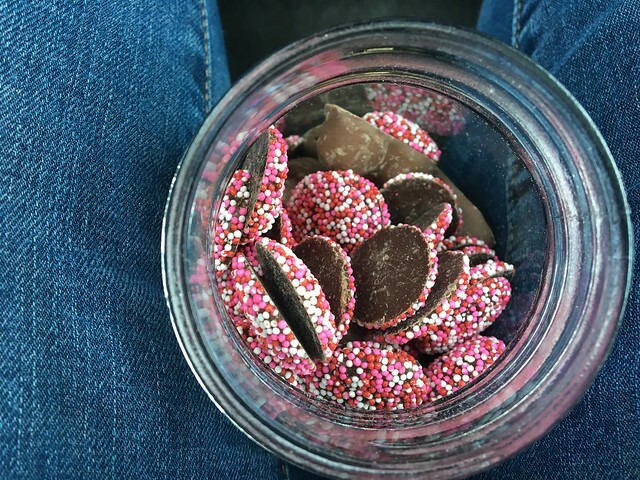 And the Elderberry Infused Hard Cider pairs very well with chocolate of any kind,” Bennett added. 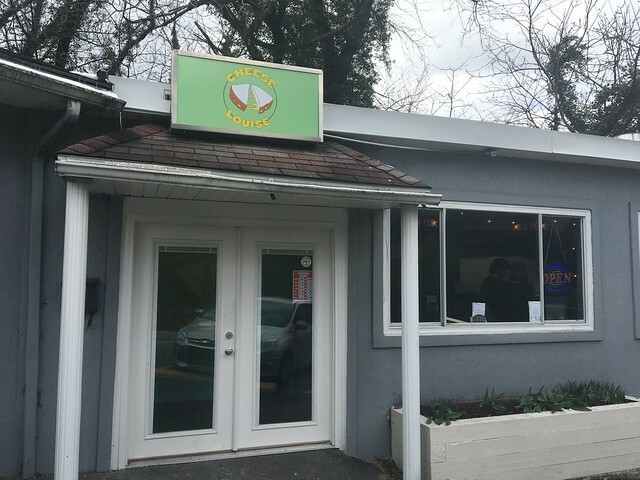 A new adventure-themed restaurant has opened in Morgantown, filling the former Charlie's Grill/Aquarium space in Westover. 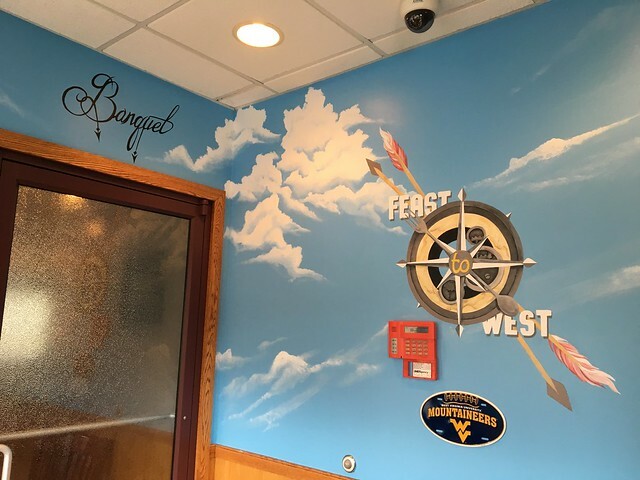 Feast to West Cafe displays a bright turquoise blue banner complete with a cast iron pan accent and with various whimsical features -- like compasses, clouds and arrows. 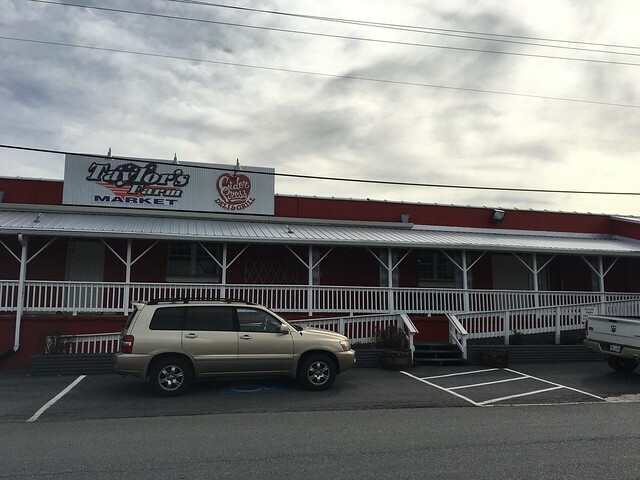 This standalone restaurant has the luxury of a sizable parking lot and an adjoining banquet room. So, I arrived early on their opening day for lunch. They serve breakfast, lunch and dinner. I was so excited to try it, I didn't want to wait another day -- but I did at least wait for the second meal of the day so they had a little time to get adjusted. Walking in, the staff was friendly and eager to please. We were seated in a booth, and I took a moment to look around: It was a pretty busy opening day. The theme spread to the dining room with license plates on the wall. 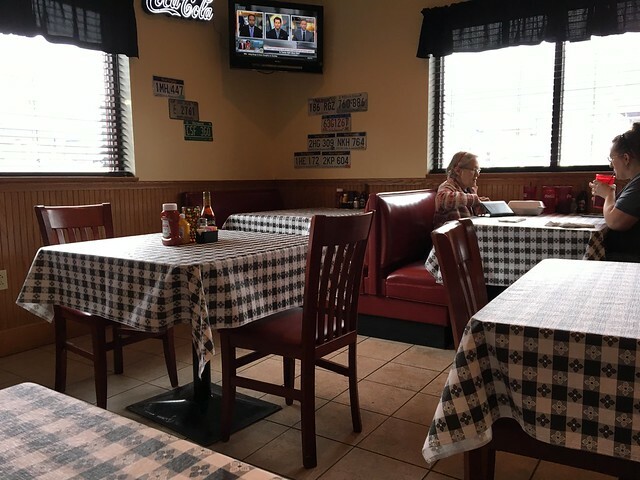 Black checkered tablecloths topped each dining space, and it was simply decorated otherwise. 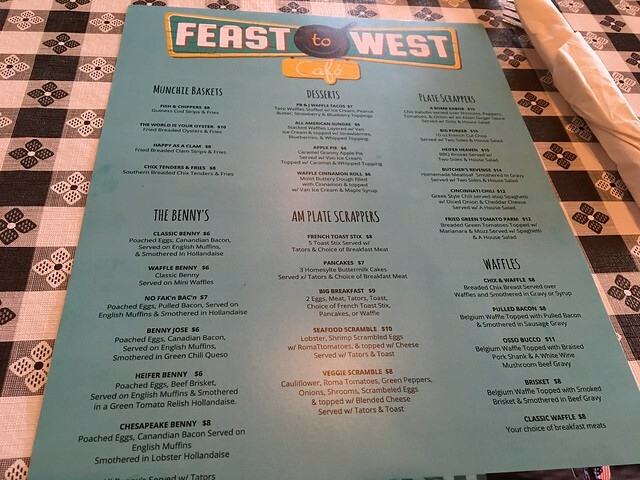 The menu is large: The front features breakfast of all kinds - eggs Benedict, pancakes, interesting types of waffles. 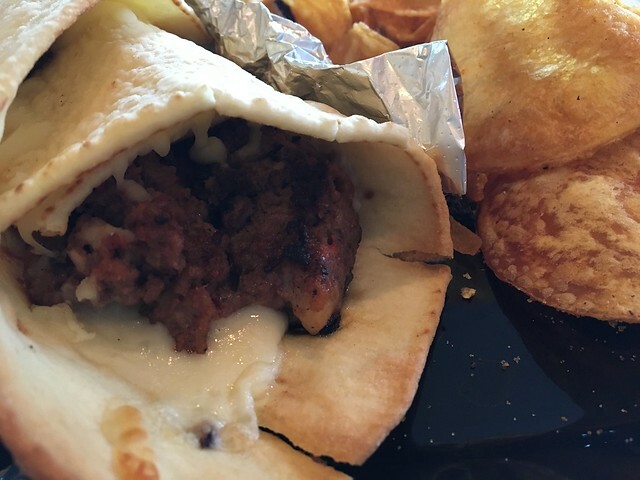 The other side features more lunch options like wraps, burgers, salads and poutine (!). 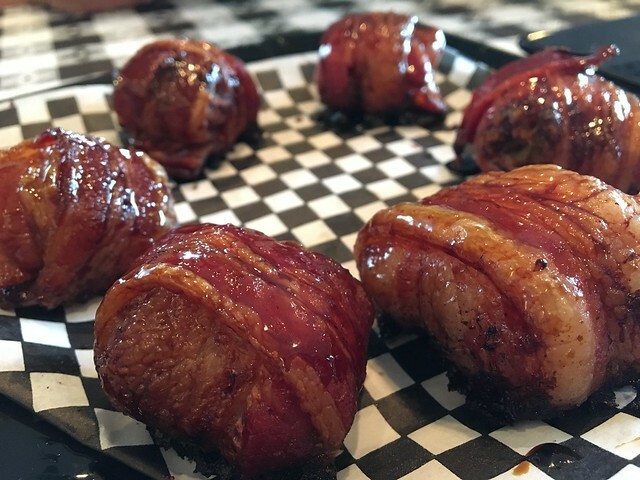 We started off with a couple appetizers: Bourbon Bacon Balls, which were bourbon-glazed bacon and onions wrapped around Todd's famous meatballs. The flavor here was spot-on sweet and salty, and the meatballs that had the crispier bacon was really a good pairing. 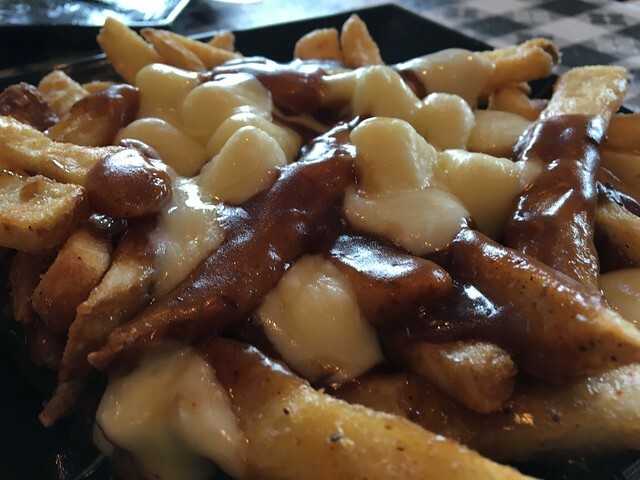 We also ordered the poutine - fries smothered in beef gravy and Wisconsin cheese curds. I've had a good bit of poutine in my travels to both Montreal and Quebec City, and I have loved it. This was an OK rendition. I think the gravy was a bit too concentrated and the curds too melted. But, not sure there is anywhere else in town you can actually get poutine, so I appreciate the addition. For my entree, I ordered the "Don't Let Your Meat Loaf," which was homemade meatloaf with sweet and sour sauce, melted mozzarella and provolone cheese. I was surprised to see this served in a tortilla wrap. I knew it was a “handheld,” but I assumed it would be served on bread. Without the bread, it doesn’t get the same sort of starchy goodness that is what makes meatloaf sandwiches so good. So, the meatloaf itself was moist, flavorful. Sauce was tasty, but I wish there was more of it. And, I’d definitely go for thick slices of white bread for that classic I remember from my childhood. Housemade chips on the side were a nice touch. They had just a little bit off heat, too. And, because we went full out, I also ordered the “PB&J Waffle Tacos” for dessert. 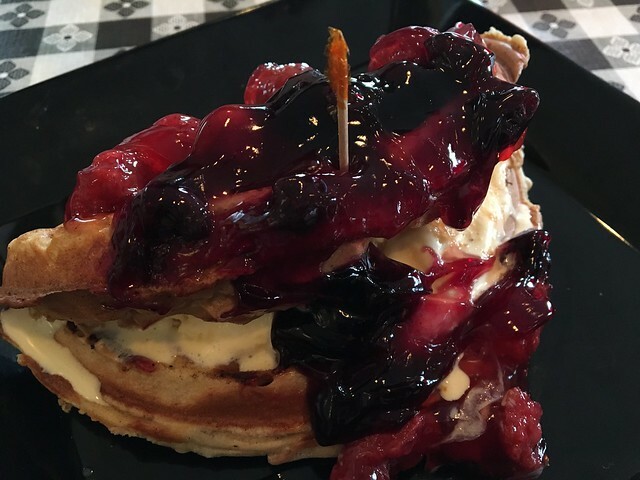 This is “taco waffles stuffed with ice cream, peanut butter, strawberry and blueberry toppings.” This was actually one large waffle that had peanut butter spread on the inside with some ice cream and strawberry and blueberry on top. The waffle was so thick, and it was folded, so I got more waffle than anything - but I ended up scooping some ice cream out so I could get a full taste. It’s pretty large, so I think it’s definitely one to share. It can get pretty dense with all the waffle and peanut butter, so a thinner waffle or more ice cream helps balance that out a bit. Service was a bit spotty, but no fatal flaws. And, it wasn’t too pricey considering how much we ordered. 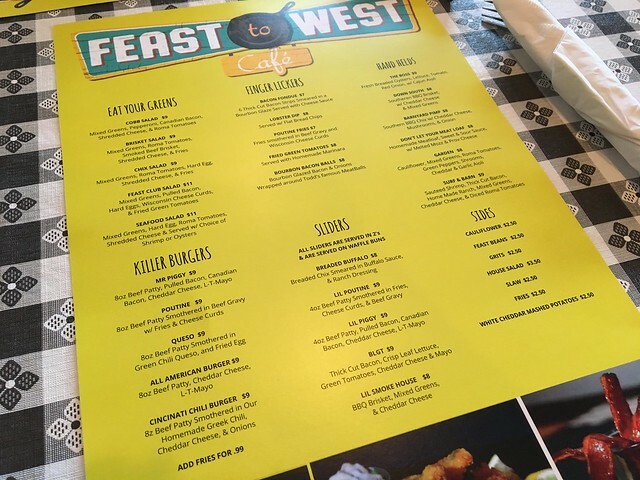 I think I need to try a few different things on the menu - the various waffles, like chicken & waffle, osso bucco waffle and pulled bacon waffle all sound super interesting. The menu is a bit all over the place, but I like that there are some things I’ve not seen before in town. Does it fill a huge void in town? That’s yet to be seen. 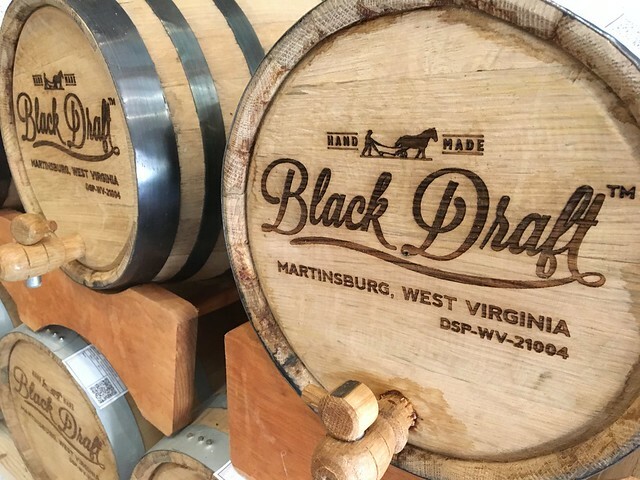 Distilleries are popping up all over the Mountain State, and few are as impressive as Martinsburg's Black Draft Distillery. 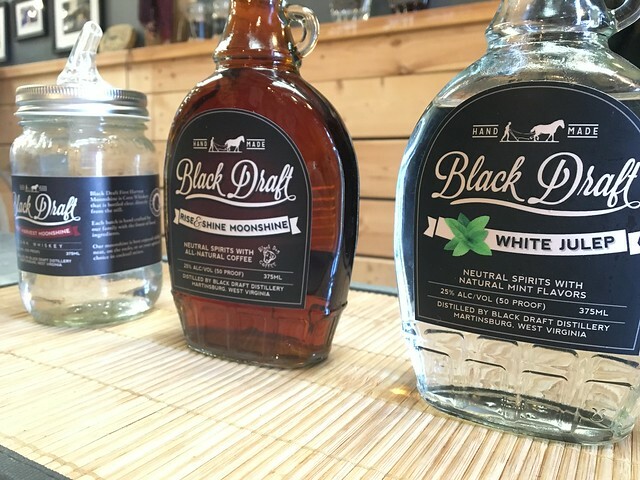 Serving up authentic moonshine, Black Draft Distillery is crafted in a converted horse barn behind the owners' home. It began with a remarkable horse. Before there was a Black Draft Distillery, we were just Black Draft Farm with a Percheron draft horse named Biscuit. For ten years we were known as “that farm with the big beautiful horse”. The one that would ride through the nearby neighborhoods, bringing friends and family out of the homes to meet her and go on rides. And, they’d fall in love with her just like we did. And every year starting in the fall, she became the main horse that rode in the Apple Harvest parades, then as Santa’s main ride for the Christmas festivities of our town’s Annual Tree Lighting ceremony. Last fall, we suddenly lost her, and the barn was left empty with her spirit still very much a strong part of the farm. And that is when we decided to take a new chapter in our lives in a very different direction. We sat down as a family, and decided to start a new business and bring the farm back to life again. We wanted to bring back the plow-to-earth business that would make our ancestors proud, and that could be handed down to the next generation. And that is when we decided to get into the whiskey business. When it came time to choose a name for the new venture, there was only one that would honor the spirit of our beloved Biscuit. These stories. That horse. These generations. And, that moonshine. This is what brings family and friends together. And that’s what makes moonshine great! I was fortunate that Glen and Tara were kind enough to allow me to visit during off-season hours. I don't get to Martinsburg often, so when I knew I'd be passing through, I got in touch with them immediately. They were more than happy to sit down with me and talk to me a little bit about what they do. There's something really special about talking to people about what they're passionate about. That's a main driving force in why I wanted to pursue journalism. So hearing the owners talk to me about how they got into this and what it's like serving their community is pretty incredible. They're welcoming and inviting, and - most importantly - totally willing to have a drink with me! 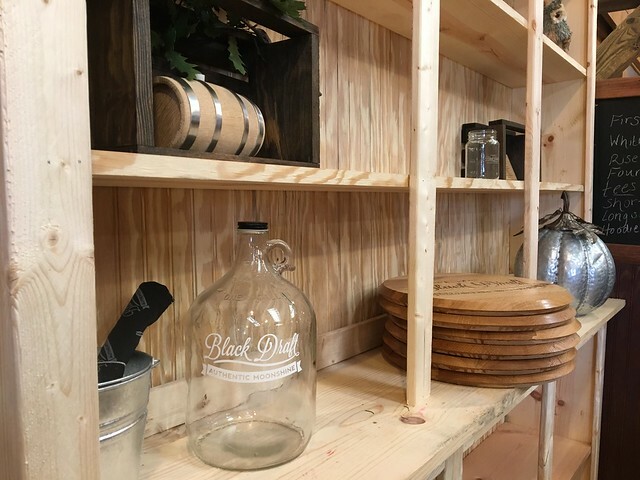 They sell four different drinks: First Harvest Moonshine, Rise & Shine Coffee Moonshine, White Julep Moonshine and a bourbon that flies of the shelf faster than they can make it. First Harvest Moonshine: Made with locally grown NON-GMO corn! Click here to read more about our local corn harvest season. 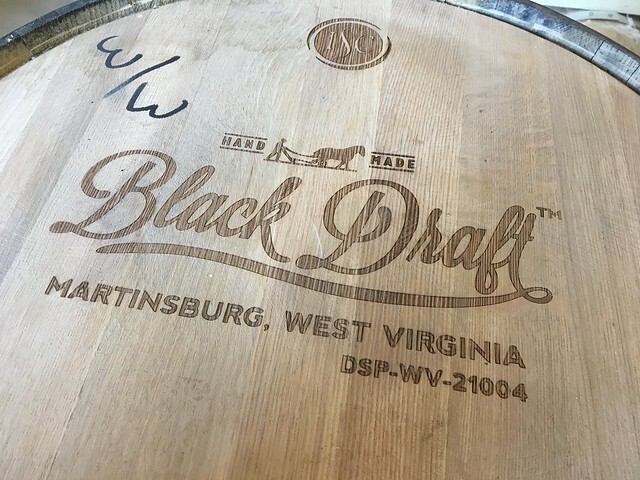 For the first time since Prohibition, you’ll soon be able to (legally) settle into a glass of true-blue, or should I say clear, West Virginia Moonshine, courtesy of Black Draft Distillery. Smooth finish so you can even taste the corn? Listen. This ain’t your college bathtub juice. Nor is it some souvenir swill from a corner in a general store. Our First Harvest Moonshine is an honest-to-goodness West Virginia unaged corn whiskey made in the heart of bootlegging country. We’re in the Shenandoah Valley, right in the foothills of the Appalachian mountains. And by incorporating local products, we are working to create a truly authentic, pure, and tasty, libation. Most moonshine is made primarily with sugar, and is typically referred to as “white lightning” mainly due to its hot, harsh taste. But we use corn, barley, and wheat to create a smoother, rich flavor and taste. 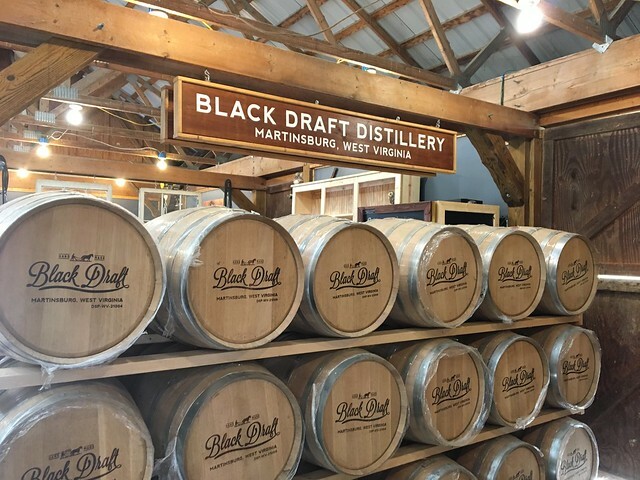 And, while some of you out there might have already tangled with the illegal variety, Black Draft Distillery promises a product that won’t land you and your buddies in the clinker. Available in 375ml- “pint” or 750ml “fifth” size. Visit our purchase page to locate where to Get Your Shine On! The regular moonshine is much cleaner and smoother than I expected a moonshine to be. The coffee moonshine - made with local roasters Black Dog Coffee - is a must for any West Virginia coffee-lover. And, the White Julep moonshine is not typically something I would typically go for, but mixed with some fresh mint, maybe some cranberry, some bitters... this could be one helluva drink. I even got to try some of the unfiltered bourbon. Top notch. If you're in the area, give Glen & Tara a call. They'd be more than happy to chat with you. And, you certainly won't regret it. I can't wait to see how they grow and expand from here. Some things just go together: peanut butter and jelly, chicken and waffles, Worcestershire-rubbed brisket and a stiff drink. The pairing helps to complement and enhance the taste of the dish, bringing out the best flavors in each component. The same goes for local businesses in Appalachia. Tamarack, which showcases the best of West Virginia through art, food and experience, recently partnered with Eastern Panhandle distillery Bloomery SweetShine to pair local foods with local drinks in a dinner that not only allowed the best flavors of each dish and drink to shine through, but also showcased the incredible culinary talent we have in West Virginia. Henderson contacted Rob Losey, co-owner of Bloomery SweetShine, and they constructed a boozy dinner that paired creative Appalachian cooking with delicious drinks — a collaboration that stretched beyond the kitchen. The evening’s first course was a roast chicken consomme with wild mushroom garlic gnocchi, summer squashes and late summer tomatoes. The dish was paired with Bloomery’s Ginger SweetShine, as well as a Dark and Shiny cocktail. The salad course featured grilled romaine, artichoke, caper berries, Nicoise olives and a creamy paprika vinaigrette. It was paired with Raspberry Lemon SweetShine and a Raspberry Lemon Cosmo. 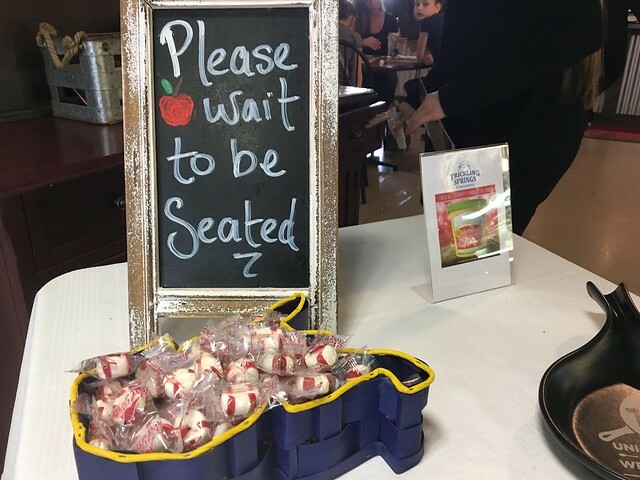 “We had some strong flavors in this course because of the grilled romaine, the artichokes, the caper berries — all bold flavors that need downplayed, so the refreshing Raspberry Lemon SweetShine, that citrus, helped tone down all the bold, smoky flavors,” Henderson said. The entree course was a Worcestershire-rubbed brisket with honey mead barbecue, sweet potato puree, Johnny bread and bitter buttermilk slaw. It was paired with Black Walnut SweetShine and The Jonas SweetShine cocktail. The dessert course was an applewood-smoked bacon and praline torte paired with Cremma Lemma SweetShine and an Appalachian Cream cocktail. “The most interesting dish for me was the fourth course because we paired on accordance of texture, rather than flavor. The praline torte has this crumbly pie texture, and the Cremma Lemma SweetShine has cream in it, so you get that creamy texture — it’s almost like getting a cookies and cream or a pie and milk texture. It worked really well,” Henderson said. The flavors, the colors and the textures paired together seamlessly for one tasty meal, but the evening, for me, was about more than that. It was about two businesses pairing to promote one another, which, in turn, promoted the unbelievable talent of West Virginia. 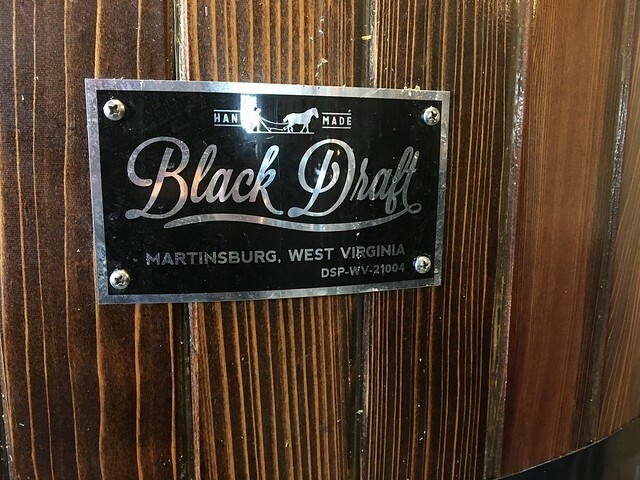 Just like a mellow drink highlighting the strong flavors of a smoky, sweet barbecue and buttermilk slaw, when two businesses in West Virginia work together, they highlight the best parts of each other. Tamarack’s skilled chefs would not have shined so brightly had it not been for Bloomery SweetShine’s inventive cordials. Bloomery SweetShine would not have had the kind of exposure without Tamarack’s commitment to promoting the best in West Virginia. Both businesses brought a different audience to the dinner table and expanded each other’s reach — which serves us better as a whole. These two partnering together brought out the best in one another, showing the absolute best of what we have to offer as a state. West Virginia has a wealth of culinary talent, and I, for one, am happy it’s on display for the rest of the world to take notice. Some things do just go together. Me and a fork. Barbecue and SweetShine. West Virginia business and West Virginia business. Combine the Worcestershire seasoning, salt and black pepper and thoroughly rub the mixture on the beef brisket. Wrap in plastic and place in the refrigerator for 1 to 2 hours. Set the smoker temperature to 250 degrees Fahrenheit and add soaked wood chips. Set the unwrapped brisket in and cook until it reaches an internal temperature of 150 degrees Fahrenheit and reduce the smoker to 225 degrees Fahrenheit. The total cook time will be 8 to 10 hours. Place a fork in brisket to check for tenderness once it reaches an internal temperature of 185 degrees Fahrenheit. If you can move the beef around with little resistance, then it is ready to be removed from the smoker. Tightly wrap the brisket in foil with the beef stock and place in a warm holding for 1 to 2 hours. Slice the brisket against the grain and brush on the leftover beef stock on the brisket or use for Au Jus dipping. The shop is full of lush greens, bright red apples and bundles of multi-colored carrots, all grown from a farm down the road. You can find your next-door neighbor working behind the register. And, it’s all located just around the corner from home. Independent groceries are growing in West Virginia and fulfilling a need for fresh, local produce in many areas that may otherwise be considered food deserts — where healthy food is limited. A small, thriving community often has a few signature shops — maybe a restaurant, sometimes a hardware store, probably a pharmacy, a post office and a grocery store. But oftentimes the nearest grocery store in West Virginia is 20 or more miles away, creating what the USDA defines as a food desert — an area where people don’t have access to fresh fruit, vegetables and other healthful whole foods. The USDA estimates people in most counties in West Virginia have some limited food access. 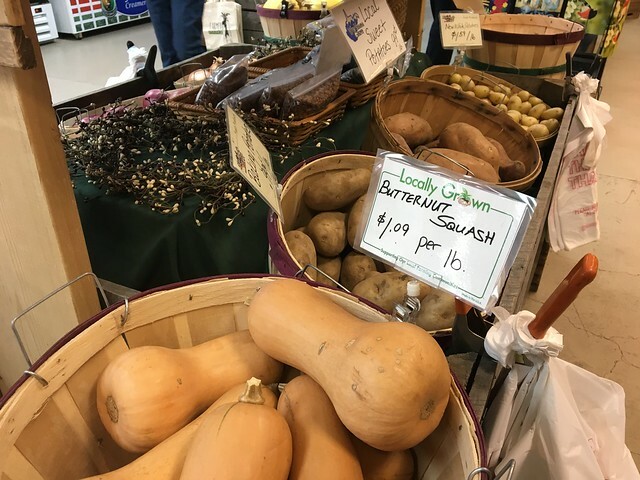 Enter local, independent groceries like Front Street Grocers, The Wild Ramp (Huntington), Alderson Green Grocer (Alderson), Highland Food & Farm Market (Davis), The Market Place (Philippi), Farmer’s Daughter Market & Butcher (Capon Bridge), Fish Hawk Acres (Buckhannon), and more. These markets — whether co-ops, locally owned or nonprofit — not only support local farmers, but they also provide the community with year-round, convenient access to other healthy food and items carefully selected to fulfill the needs of the community. And the community has a responsibility to support them in return. “We currently source local cheese, syrup, honey, greens, all of our chicken, beef and pork, winter squash, and winter storage vegetables from a mix of local farmers and growers,” Doak said. “We have nearly 1,000 different items in our store. ... We seek product attributes such as organic, pesticide-free, non-GMO, fair-trade, pastured and/or good land stewardship practices. Relationships: You know these people selling you this food. They want to do right by you, and you have an easy opportunity to request specific items, unlike at a large chain store. Health: These smaller stores have your health in mind, rather than the shelf life of a product. Health and nutrition are often at the forefront, and that leaves you with better options. Convenience: You don’t need to make a weekly grocery run for everything you need. Instead, you can stop for a few minutes every day or two to get what you need at peak freshness. And that leads to less food waste. Community: You’re putting your money directly back into the local economy. No huge chunks are heading to a corporate headquarters outside of the state. Starting a local grocery store is tough. There are infrastructure renovations, health code requirements, expensive equipment, utilities, payroll and stock to consider. And that sometimes translates to slightly higher prices for a higher-quality product. The benefit we receive, as a community, though, is exponential. Supporting these small, independent shops sets the tone for how we shop in West Virginia. And, with the rise of these smaller independent stores, we have an opportunity to change where our money goes, what food we eat and how we grow together. This flavorful, filling 30-minute Buddha Bowl with roasted sweet potatoes or yams, onion, kale, crispy chickpeas, a tahini maple sauce, and topped with kraut is a Front Street Grocers specialty. This healthy, nutrient-rich dish is representative of the types of dishes during their Saturday kitchen service, and while they rarely make the same thing twice, this recipe is a keeper. Preheat oven to 400-degrees and arrange sweet potatoes and onions on a bare baking sheet. Drizzle both with a bit of oil, making sure the flesh of the sweet potatoes are well-coated and placed skin side down on the sheet. Bake for 10 minutes, then remove from oven, flip sweet potatoes and add broccoli. Drizzle broccolini with a bit of oil and season with a pinch each salt and pepper. Bake for another 8 to 10 minutes, then remove from oven and add kale. Drizzle kale with a touch more oil and season with a pinch each salt and pepper. Bake for another 4 to 5 minutes then set aside. Heat a large skillet over medium heat and add chickpeas to a mixing bowl and toss with seasonings. Add 1 tablespoon oil and chickpeas and saute, stirring frequently. If they’re browning too quickly, turn down heat. If there isn’t much browning going on, increase heat. About 10 minutes total at slightly over medium heat is the sweet spot. Remove browned and fragrant chickpeas from heat and set aside. Prepare sauce by adding tahini, maple syrup and lemon juice to a mixing bowl and whisking to combine. Add hot water until a pourable sauce is formed. Slice sweet potatoes into bite size pieces. Divide vegetables between 3 serving bowls and top with chickpeas and tahini sauce. 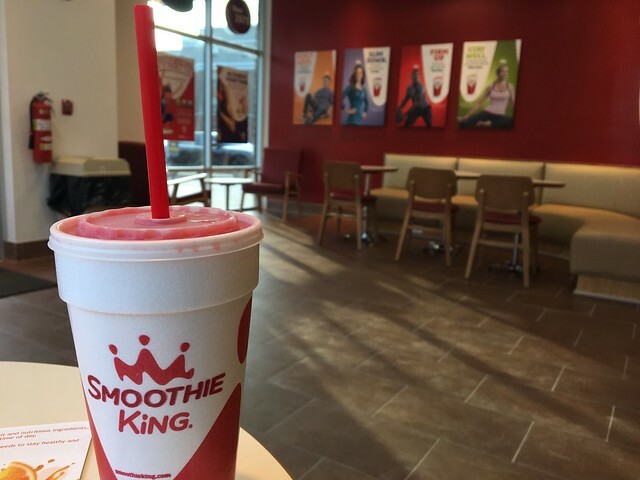 Morgantown is now home to a Smoothie King, a smoothie chain focused on health. 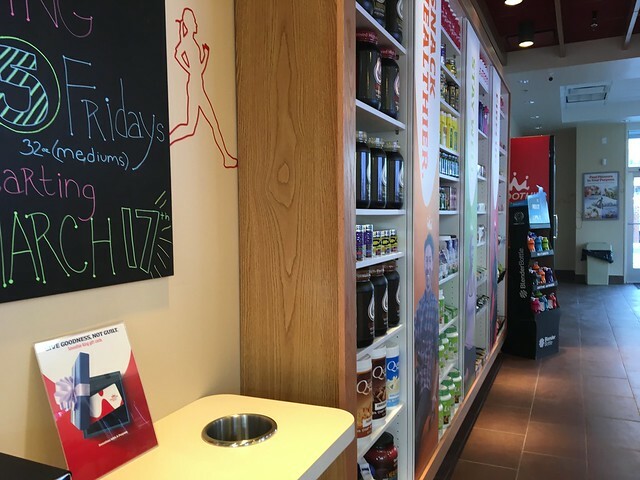 Located in the retail area of University Park, Smoothie King has a drive-thru as well as a sit-down area in the space next to the gym. From the beginning, founder Steve Kuhnau started blending for a purpose – solving his chronic food allergies. Handcrafted by our blendologists, every one of our Smoothies is still blended with a purpose – yours. Power a workout, lose weight or make food choices you feel good about with the right nutritious Smoothie for your goals and Healthy Rewards tailored just for you. I've never been to this chain before, so I was actually excited to see what it's about. 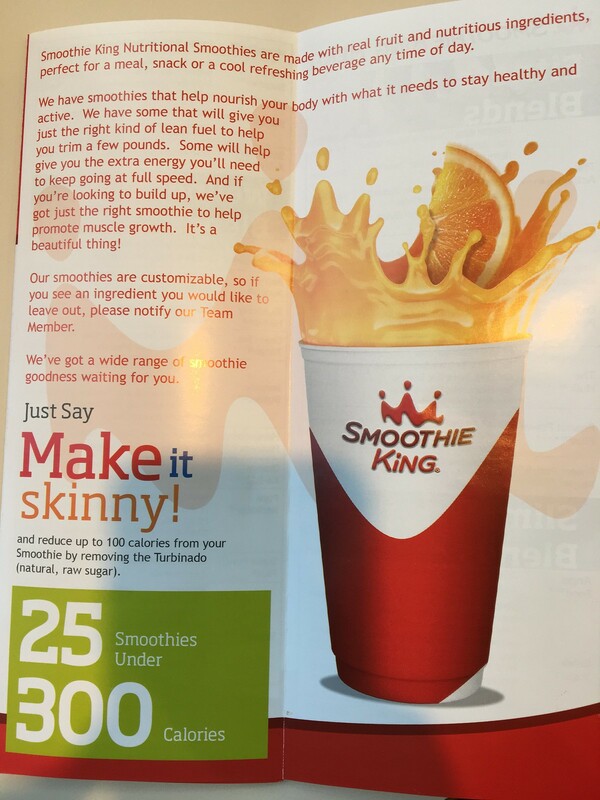 Their smoothies are split into four categories: slim blends, wellness blends, fitness blends and take a break blends. There are a number of "enhancers" you can add ... much of which I glossed over in favor of something that just tastes good. So I tried the "Berry Punch," which has "Strawberries, Raspberry Sorbet, Blueberry Juice Blend, Electrolyte Mix." I tried to pick the smoothie with the most natural ingredients that I was familiar with. No extra protein powders or other stuff here. And, this was actually really good. Cool, sweet, delicious. Not sure it's something I'd do on the regular, but maybe once in a while as a nice cool treat that doesn't make me feel tooo guilty. It's a larger chain, but I believe it's the only location in West Virginia. Has anyone else been? What's your favorite smoothie? 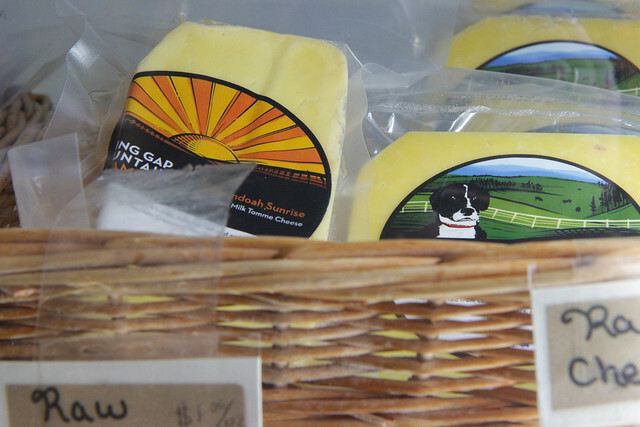 Tucked away in the hills of the Eastern Panhandle is a small creamery that produces rich, smooth cheeses. 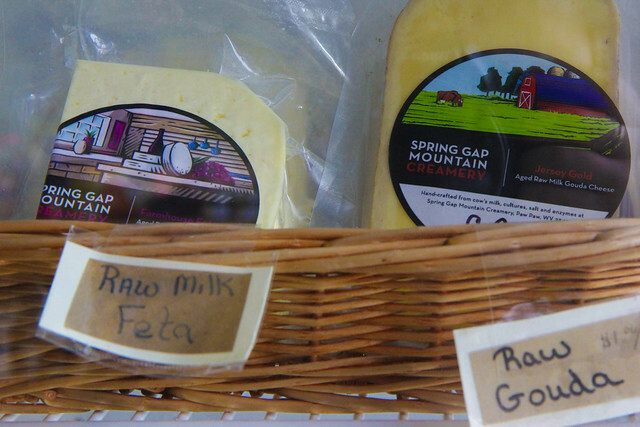 Located in the town of Paw Paw, Spring Gap Mountain Creamery has been churning out cheese for about eight years. There’s just one thing: It’s raw. The cheeses are made with raw, or unpasteurized, milk and then aged for a minimum of 60 days. Pasteurization is the process of heating the food to kill dangerous pathogens like listeria, E. coli and salmonella. Then, vitamins like A and D are added back into the milk. The drinking — and selling — of raw milk has been hotly contested in the West Virginia Legislature in the past, with opponents saying it’s unsafe, and proponents claiming raw milk is healthier. But Penelope Sagawa thinks it just tastes better. “When you’re boiling the milk, you’re killing everything in it, then putting back in vitamins. With milk that comes out of a cow, it still has micronutrients in it. 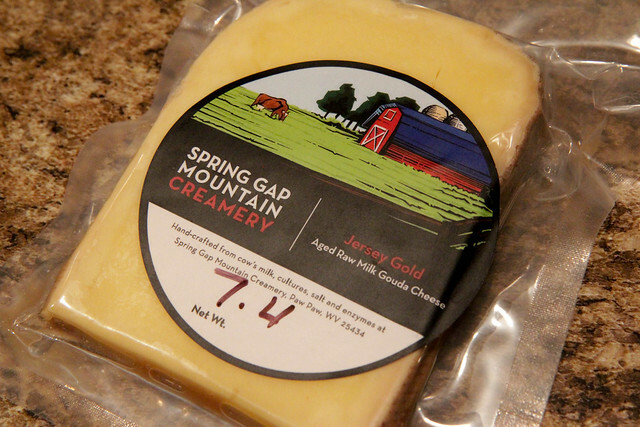 We use that milk and make cheese,” said Sagawa, who owns Spring Gap Mountain Creamery along with her partner Jurgen Schelzig. It’s a loaded product — there are some political implications associated with raw milk. But, the addition of another local cheese option, especially one so rich and creamy, in a cheese-scarce state gives me pause. Sagawa and Schelzig didn’t set out to make a political statement; rather, they left their 9-to-5 jobs in Washington, D.C., for a mountain getaway and fell in love with a property in West Virginia they decided to call home full-time. They mulled a few ventures like vegetables, but if the crop fails, you have nothing. Fruits were nixed because an orchard would take years before bearing fruit. Chickens were risky because if they don’t lay, you can’t make it, she said. That’s when they landed on cheese. Cheese was interesting to them. Few people were making it, and the couple could learn the craft on their own. The pasteurization equipment, though, would cost upward of $25,000, which wasn’t financially feasible. So they instead opted to go raw, eliminating the need for costly pasteurization machinery. The couple buys their milk from Hedgebrook Farm in Winchester, Virginia, which has a small herd of about 25 Jersey cows; Jersey cattle tend to have a higher butterfat content than others, Sagawa said. They drive a stainless-steel milk tank to the farm after the farmer, Kitty Hockman-Nicholas, does her morning milking, and they truck 350 gallons of raw milk back to West Virginia to turn into cheese the same day. Then the cheese sits. “The [Food and Drug Administration] requires a 60-day minimum aging process for raw milk cheese. Cheese cultures added to the milk crowd out any potentially harmful bacterial growth and is considered ‘self-pasteurized,’” Sagawa said. After 60 days, you can purchase Jersey Gold gouda, Shenandoah Sunrise tomme, Sophie’s Select cheddar, West Virginia Blue, Farmhouse Feta and Bloomery bloomy rind cheese. This type of cheese, which potentially raises questions of safety, also provides another locally made cheese option. There aren’t a ton of cheesemakers in West Virginia, and creating more opportunities for customers who love cheese — like me — seems like it could only be better for our growth as a state. Do risks outweigh the benefits? That, I don’t know. The FDA considers it safe. And I’ve had my fair share and can attest to its deliciousness. So, what do you think? Does raw cheese get a raw deal? For more information or to find out where to purchase the cheese, visit www.springgapmtn.com/index.cfm. Bring 2 quarts water to boil in large pot with 1 1/2 teaspoon salt. Add pasta, stir and cook until al dente. Drain pasta and return to pot over low heat. Mix eggs, 1 cup evaporated milk, mustard mixture, 1/2 teaspoon salt, pepper and hot sauce in bowl. Add egg mixture and 2 cups of cheese to pasta and stir until thoroughly combined and cheese starts to melt. Gradually add remaining evaporated milk and cheese, stirring constantly until hot and creamy, about 5 minutes. Morgantown is finally home to a grilled cheese restaurant. Oh. A grilled cheese restaurant, you ask? Yes, a grilled cheese restaurant. This is a sort of ~trend~ going on where restaurants elevate the classic grilled cheese sandwich with thick artisan bread, crazy ingredients and a cool, modern twist on a childhood favorite. 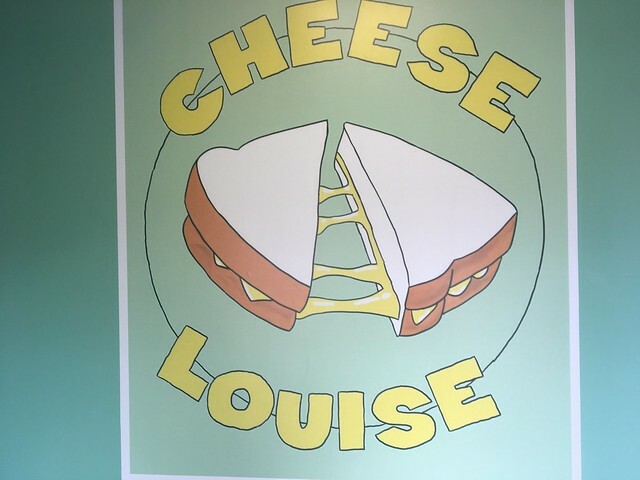 Cheese Louise is located at the top of Willey Street next to Town Hill Tavern. Parking is a bit precarious here, so just be careful. The area is right in a bend, and the parking lot isn't wide. The restaurant has some window seating and a couple high-top tables. It's quite small, so I imagine most of the business is take-out. There was just one person working - also the owner, I believe - so there was a bit of a wait before I could place my order at the counter because there was one couple in front of me. After he got their sandwiches started, he took my order. 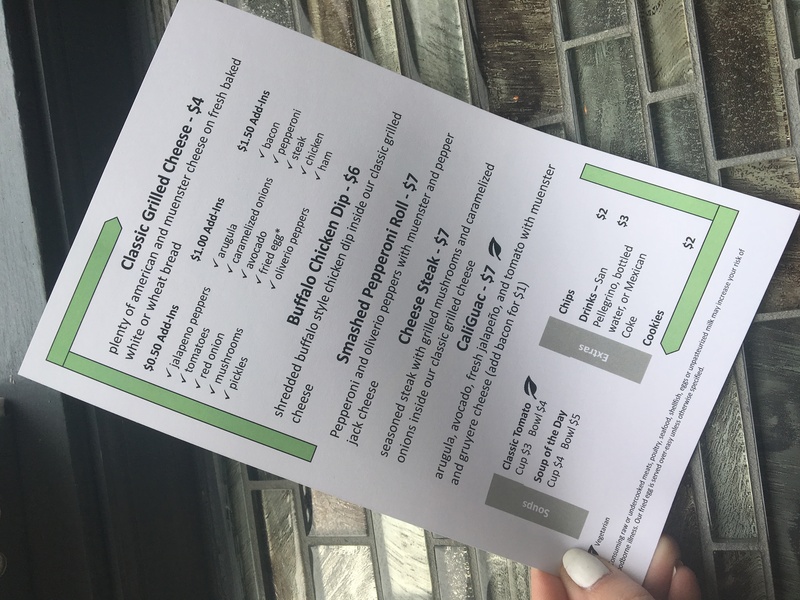 The menu simply has one main item - the classic grilled cheese, made with American and muenster cheese on white or wheat. Then, you can add ingredients, like mushrooms, onion, pepperoni, fried egg, etc. This concept is a lot different from other grilled cheese restaurants I've been to - like Melt in Cleveland or The Grilled Cheeserie in Nashville - where they craft entire sandwich concepts with really creative ingredients. Like a lasagna grilled cheese or a pimento cheese and fried green tomato grilled cheese. 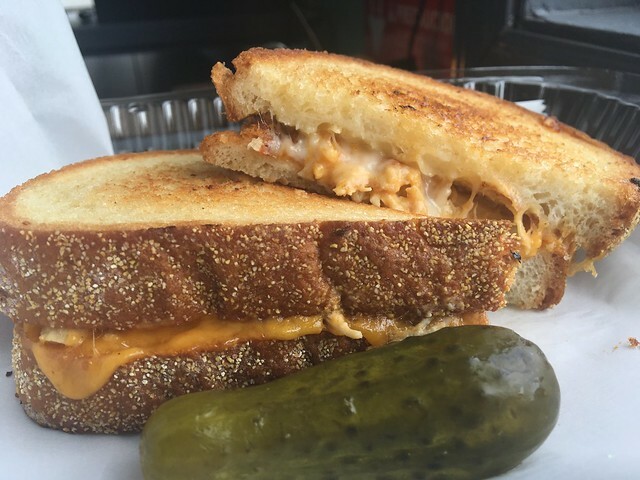 The most creative grilled cheese on this menu was the "buffalo chicken dip," which had shredded, buffalo-style chicken dip inside a classic grilled cheese. I went with that, as well as a cup of tomato soup, and a bottle of water ($3 for a bottle of water!). After a few minutes, my sandwich was packaged and ready to go. The thick bread is lightly toasted, the cheese was nicely melted, and there was ample heaps of buffalo chicken between the slices. It was good. I wouldn't hate even more cheese. I liked the crunchy pickle on the side, too. 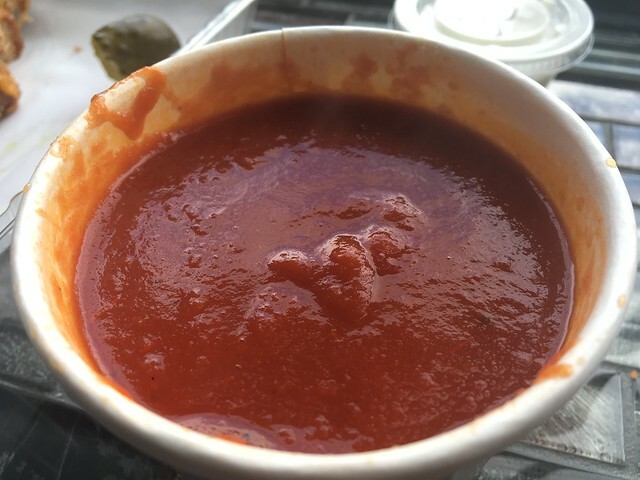 The tomato soup was tasty - perfect for dipping a grilled cheese into. Usually I like my tomato soup creamy, but considering it was paired with the grilled cheese, it was all good. My good friend Vicki said the thick bread comes from Breadworks in Pittsburgh, and that Grandma's Gumbo (from Biloxi) is delicious. The "smashed pepperoni roll" also looked enticing and may be my next order. It's simple, but it's tasty. I do wish there were more creative offerings. I can - in my limited skill set - make a pretty damn good grilled cheese, and could easily add in any of those toppings. But, I want to see some more comprehensive sandwich concepts. Not just a picking and choosing. I'd love to see something a little more. I hope that that may come in time. 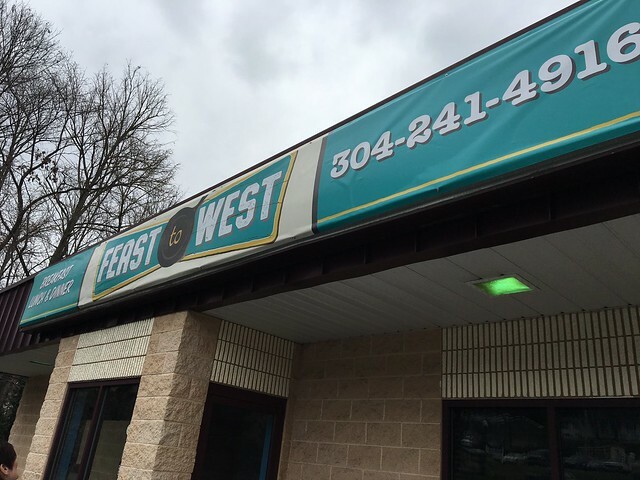 We're slowly ticking off places on the 101 Most Unique Places to Dine in WV list, and my latest adventures took me over toward the Eastern Panhandle in Inwood, West Virginia. This particular stop was exciting because not only did I get to tick another restaurant off the list, but I got to stop at a locally owned grocery store. Cider Press Deli is located within Taylor's Farm Market. 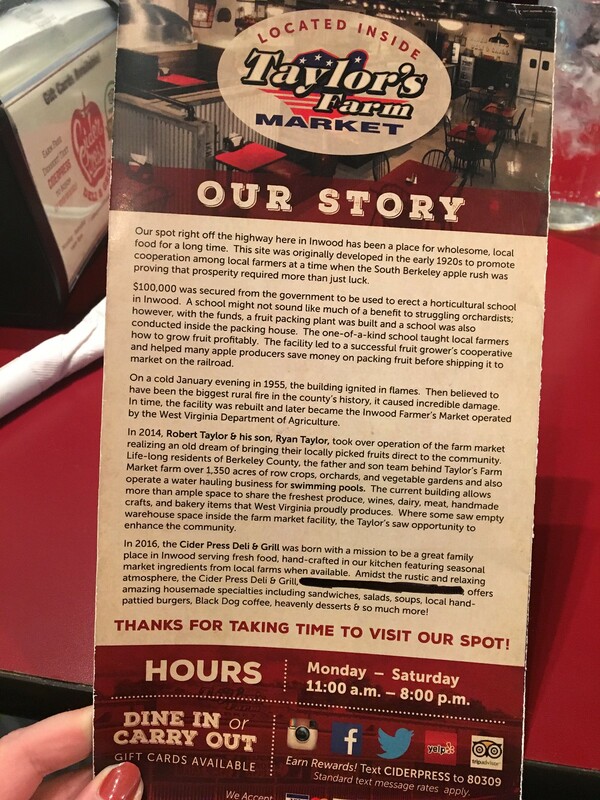 So, let's talk about Taylor's Farm Market first since you walk through it to get to the restaurant. 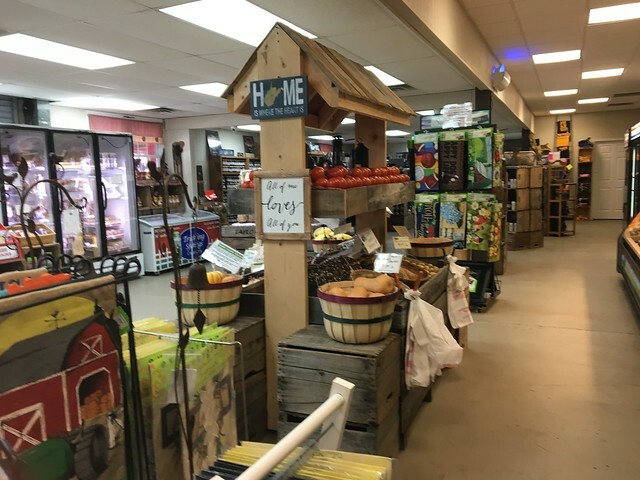 The market has a lot of great fresh produce like apples; bakery items like pies and and fudge; dairy items like cheese and milk; honey; meats; sauces; drinks; jams and jellies; West Virginia decor; salsas; mixes; candy and even a wine area. It was this wine room where I found Cox wine, which is the first time I've seen it in person and will write about it a bit later. It's really a nice market to peruse, and there is a wide range of items to peruse. From fresh food to local merchandise, there's a little bit of something for everyone. It seems to be a mix of locally grown stuff and other stuff that's just relevant to locals. So, I ended up getting some of that wine, as well as some marked-down Valentine's Day candy (I visited close to the holiday). Perks. And, the caramel-filled chocolates I had were divine. 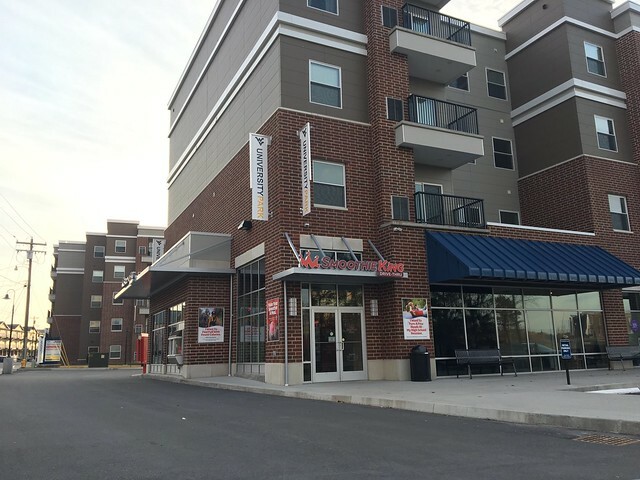 Welcome to the area's newest Farm Market. We invite you to come check out what everyone has been talking about! We carry many West Virginia wines, local honey, different jams and jellies, apple butter, sauces from Oliverio’s Peppers in Clarksburg—in fact, we're so local that some of the honey we will be selling are from the bees that were in our apple orchard for pollinating earlier this spring! 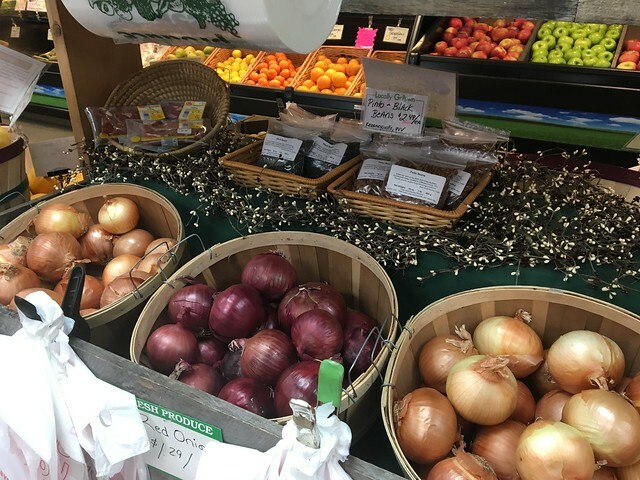 We have farm fresh produce, bulk candy, pies, organic ice cream, local meats, baking mixes, organic milk, local free range eggs from Gerrardstown, tomatoes, and much more in season. What we don’t raise ourselves, we are buying from local farmers when available so our customers will have different types of produce to choose from when they walk in our market. This is the best our great area produces, and our family is so happy to bring it all together to share with your family. And, If you walk through the market and toward the back, you'll find a full-service restaurant in Cider Press Deli. Our spot right off the highway here in Inwood has been a place for wholesome, local food for a long time. This site was originally developed in the early 1920s to promote cooperation among local farmers at a time when the South Berkeley apple rush proved that prosperity required more than just luck. $100,000 was secured from the government to be used to erect a horticultural school in Inwood. A school might not sound like much of a benefit to struggling orchardists; however, with the funds, a fruit packing plant was built and a school was also conducted inside the packing house. The one-of-a-kind school taught local farmers how to grow fruit profitably. 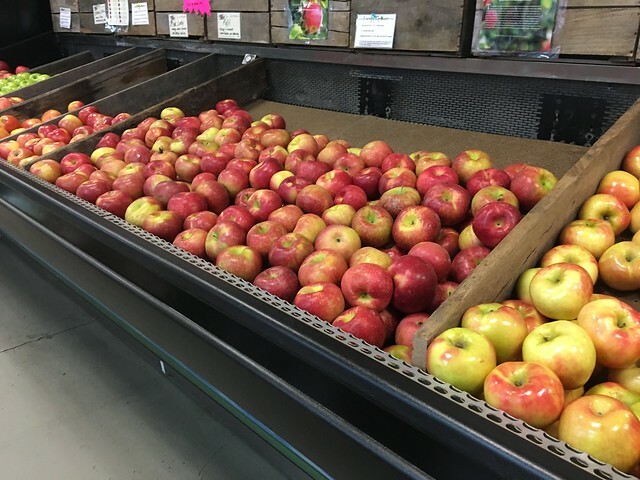 The facility led to a successful fruit grower’s cooperative and helped many apple producers save money on packing fruit before shipping it to market on the railroad. On a cold January evening in 1955, the building ignited in flames. Then believed to have been the biggest rural fire in the county’s history, it caused incredible damage. In time, the facility was rebuilt and later became the Inwood Farmer’s Market operated by the West Virginia Department of Agriculture. In 2014, Robert & Ryan Taylor took over operation of the farm market realizing an old dream of bringing their locally picked fruits direct to the community. Life-long residents of Berkeley County, the father and son team behind Taylor’s Farm Market farm over 1,350 acres of row crops, orchards and vegetable gardens and operate a water hauling business for swimming pools. 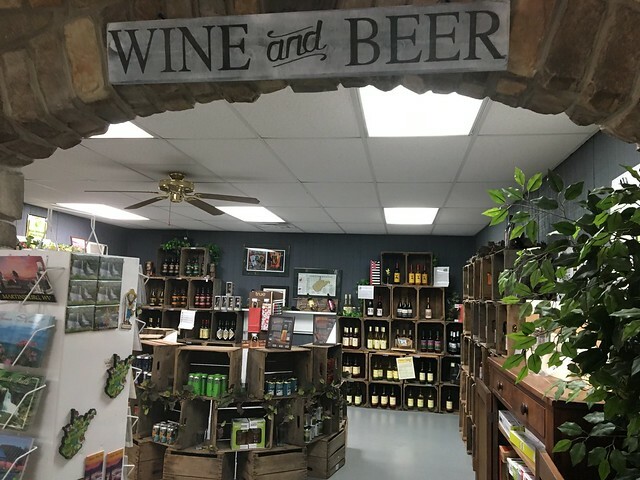 The current building allows more than ample space to share the freshest produce, wines, dairy, meat, handmade crafts, and bakery items that West Virginia proudly produces. 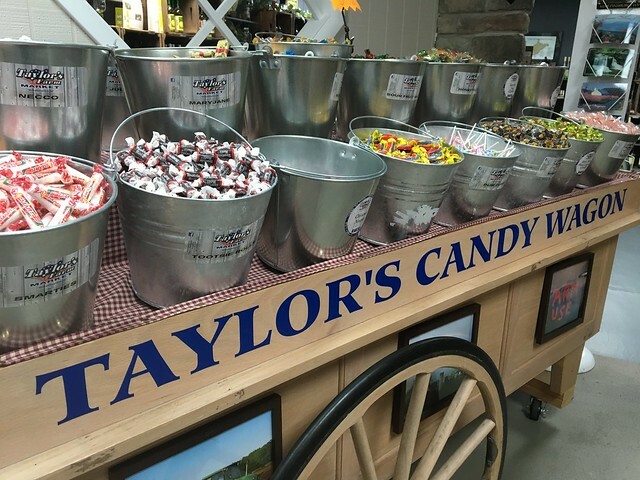 Where some saw empty warehouse space inside the farm market facility, the Taylor’s saw opportunity to enhance the community. 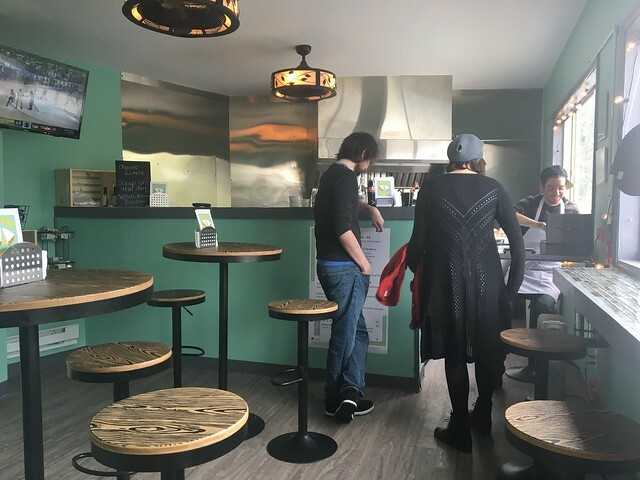 In 2016, the Cider Press Deli & Grill was born with a mission to be a great family place in Inwood serving fresh food, hand-crafted from scratch featuring seasonal market ingredients from local farms when available. 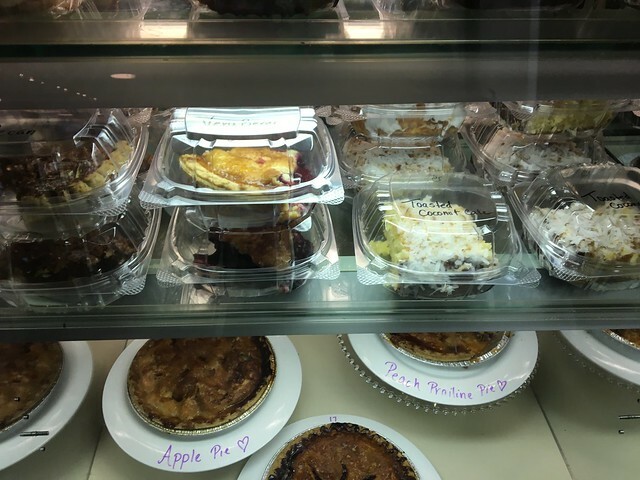 Amidst the rustic and relaxing atmosphere, the Cider Press Deli & Grill offers amazing housemade specialties including sandwiches, salads, soups, local hand-pattied burgers, Black Dog coffee, heavenly desserts and so much more! Thanks for taking time to visit our spot! 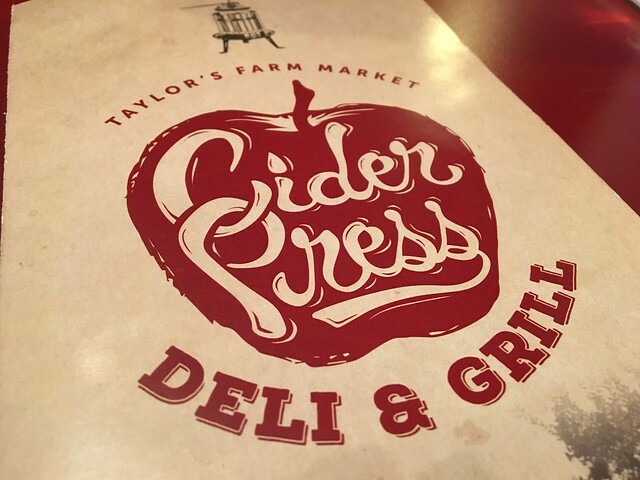 The Cider Press Deli & Grill is located inside Taylors Farm Market. So, I walked in and was greeted immediately. They seated me in a small booth that wouldn't fit more than two people. The restaurant was pretty busy, which was a good sign. The interior is simple, with some older photos on concrete block walls. A little dark, a little chilly. But, some country touches make it homey. It's comfortable. 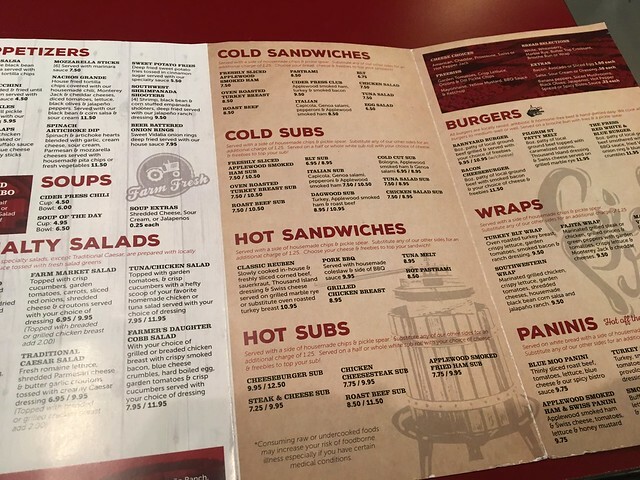 The menu features salads, sandwiches, subs, wraps, paninis and burgers - basically lots of variations of sandwiches. For me, I thought it was fitting to try "The Press Red White & Blue Burger," which was 8 oz. 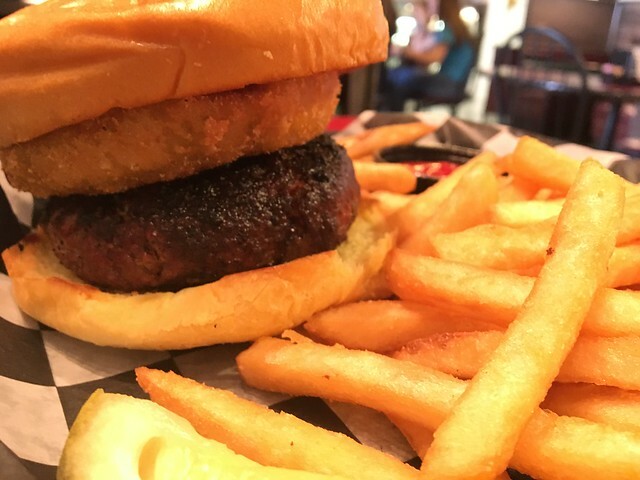 of charbroiled, local ground beef smothered with BBQ sauce, fried Vidalia onion rings and blue cheese crumbles on a brioche bun with fries on the side. This was one thick burger. It wasn't especially wide, but it was thick. That made for a pretty tall burger that I smooshed down to make it a bit more manageable. Despite it being so thick, it was still juicy and not overcooked (always my worry). The onion ring was nice for some crisp, and the BBQ for some tang, and the cheese for a creamy element. All together, it was a decent burger. The fries were a sort-of fried & battered almost. Thick, crispy and very good. Unfortunately, I didn't get a chance to try dessert - but look at this dessert case. Looks phenomenal. 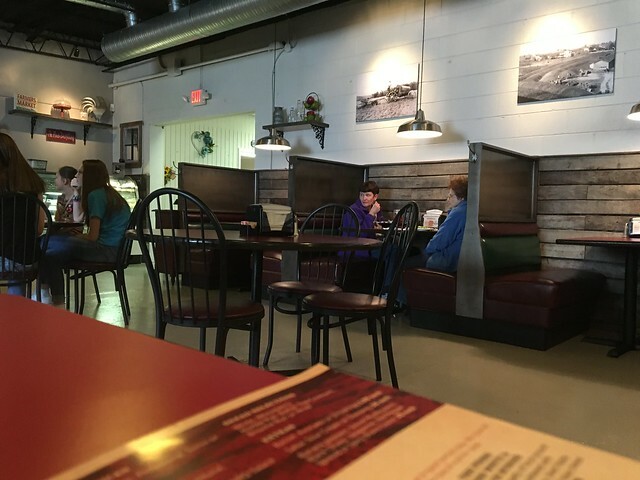 This restaurant + combo market is a nice little gem in the Eastern Panhandle. Good food, a nice market and a good way to spend an afternoon.